Chuck Berry and Little Richard at "The Tonight Show With Jay Leno"
then thats a different story. thats why Leno probably made the TV reference, as to not interfere with the Universal plug. Jim Marsala, Chucks long time bassist. Chucks "Back In The USA". Richard cranked on the keyboards, and Chuck strummed along on guitar. Richard did his usual yelps and yips, and howls. It seemed Richard was trying to take over the spotlight. a lot of tv time too, as he took an extended solo, briefly going up into the audience. singing backup. Richard was up in front kinda just dancing around and warbling something in the mic. I think to try and say "Hey this was supposed to be a duo kinda thing". He even threw in a quick duckwalk. band (ok it SEEMS like that many, does he really NEED two drummers?). and when the planets all aligned, he still rocks the dump. So that was the show. Im also going to the gig on Sat, so Im curious how it will go if they do perform toether. If so, I think it will be completely different, with no TV cameras. I had my VCR rolling, so if anyone wants a copy, email me, and Ill see what we can do. Rock'n'roll legends Chuck Berry and Little Richard are teaming up for a pair of appearances. called the Four Seasons studio, not far from the airport in St. Louis, his home town. early summer, will include a dozen new songs. black silk casino jacket and his trademark sailor's cap. "It keeps the sun out of my eyes," he said. "Baseball caps are better, but Chuck Berry is no hip-hop salesman." months for violating the Mann Act. When he arrived at Wendy's, two young fans approached, carrying yellow napkins to be autographed. nothing funny about being hungry in a foreign land and reporters asking you dumb questions about your hits. and good hamburgers. My dad used to grow vegetables when I was young: cucumbers, squash, tomatoes�you name it. The vegetables in Europe don't compare." He brought the food in a bag back to the studio, and as he ate he talked about the new album. commercial purposes, to make money." him that audiences want to hear only oldies. the smell of liquor, somehow I'm carried asunder by the surprise of liquor on the breath of a strange lady." for the pleasure of baby boomers. In record stores, his CDs are always in the "Vintage" section. "It's an insult,"
Berry said. "But this new album should help me bust out of that ghetto." edited by number one fan Johan Hasselberg from Sweden has been hacked. than 2000 hours work on it. The address was www.geocities.com/allaboard70. Born into a musical family that included three piano playing sisters and parents who sang in the church choir, Chuck Berry was around music from an early age. By the time he was seven he could pick out rhythms on the piano. During high school Chuck became interested in the guitar and began playing house parties and church functions. In 1952, Chuck Berry formed his first group and began playing local clubs in St Louis. Berry was only playing music part time and was considering becoming a photographer or a hairdresser until his life was altered forever during a vacation to Chicago in May of 1955. In Chicago, Chuck met Muddy Waters who suggested that Chuck meet with the founder of Chess Records. Berry returned home to record his band and then returned to Chicago with a tape of four songs. The homemade tape reached Leonard Chess of Chess records and soon Chuck and his group were in Chicago recording. Chuck Berry's first release, "Maybellene" became a Top Twenty hit within a few weeks and influenced rock and roll for years to come with its rhyming lyrics, steady beat and guitar solo. Also, "Maybellene" crossed color lines in music and became equally popular with white audiences as well as African Americans. Between the years of 1955 and 1958 there was constantly a Chuck Berry record in the weekly trade music papers; sometimes there were two different records on the charts at the same time. Songs like "Roll Over Beethoven", "Sweet Little Sixteen" and "Johnny B. Goode," broke music and color barriers, making Chuck Berry one of the most successful and popular musicians of any race. During the late 1950's, Berry was making frequent film and television appearences and touring the United States. 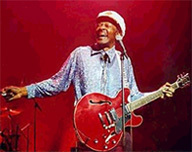 By the 1960's, Chuck Berry's music had become popular in England, where it influenced fledgling rock musicians like the Beatles and the Rolling Stones. During the 1970's and 80's Chuck Berry continuted to tour and record albums but at a slower pace. He released three albums in the 70's including Chuck Berry's Golden Decade, Vol 2 and Vol 3 and five albums in the 80's like Greatest Hits: Live and The Chess Box. The 1990's saw the release of a slew of albums including Brown Eyed Hansome Man and Let It Rock. In honor of his 75th birthday in 2001, Chess Records reissued Chuck Berry's 1963 classic, More Chuck Berry. As one of the most influential performers in the history of rock and roll, Chuck Berry's music broke color walls and introduced the blues and rockabilly to pop music. Still performing and recording, Chuck Berry shows no signs of stopping and his music is being discovered by a new generation of fans.